Exploring the politics, places, people, and principles of interest to the folks of North and South Carolina, and their neighbors. 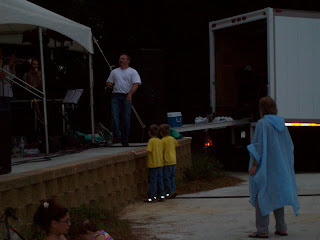 On June 4, 2009, I caught the initial installment of Kinston's occasional concert series for the summer that they are calling "Sand in the Streets." Pride of Kinston is sponsoring the concert series to promote Kinston's downtown. I have to admit, I am one of the people that has been slightly more than skeptical about the idea that Kinston's strength is as a tourist attraction. But having said that, "Sand in the Streets" was an incredible evening. First, the setting was one of the best that I have been in for this type of event. The concert was held (and will be held throughout the summer) at the Neuseway Park at the intersection of Gordon and Mitchell streets, just a couple of blocks from the King Street bridge in Kinston. The air was clear, the temperature was warm but not overpowering, and the trees and proximity to the Neuse River, which the park backs up to, gave a fresh-scrubbed aspect to the breezes blowing in off of the river. It was a genuine family event. In one section was a group of teenagers playing hackeysack, in another was a mother playing catch with her small son. Just in front of the stage is a huge concrete slab for a dance area, and the number of three-year olds showing off their dance moves gave an air of cuteness to the evening that was worth the trip all by itself. Everywhere one looks throughout the park are couples and small groups sitting in gazebos, at picnic tables, and on park benches talking, laughing, or swaying to the music. Parking is plentiful both in the park area and across the street in the large parking areas that back up to the downtown businesses. Various drinks and snacks were for sale, but admission to the concert itself was free. 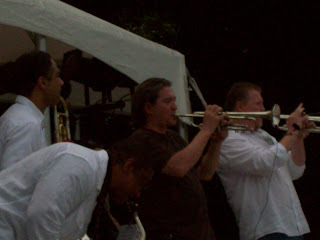 Bull City Syndicate is a horn/funk band of the 1970s variety reminiscent (to me, at least) of K. C. and the Sunshine Band, minus the embarassing haircuts and clothing. The bass-heavy, accessible funk included a whole host of cover tunes that would have been familiar to anyone over the age of 20, including tunes by Michael Jackson, The Jackson 5, Chicago, and K. C. and the Sunshine Band. 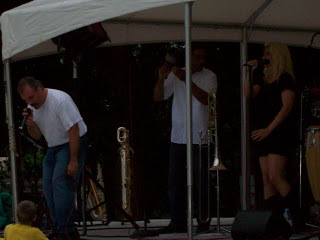 A trio of singers, including the band's newest member, Charlotte Gregory, shared the crooning duties, but the distinctive sound of the band was at its finest when trumpet, trombone, and saxaphone was leading or intertwining with the traditional power rock core of guitars, bass, and drums. I am oddly surprised every time that I go to a concert in which music from the 1970s or 1980s is played at the number of small children and teenagers who know the words to these songs from my own youth word for word. This time was no different. The music was, as I say, upbeat, familiar to most, and expertly rendered. The showmanship of lead singer Dan Lantier was professional but fun - inviting the small children and teenagers gathered around the stage to sing, dance, and enjoy themselves. The "Sand in the Streets" series continues from now through August 13 at Neuseway Park. Future bands include Teresa James (June 18), The Showmen (fireworks this night, July 4), Sweet Potato Pie (July 16), the Four Knights Band (July 30), and one of my own favorite bands to close the series - the Band of Oz (August 13). Moon's Grill is a small diner that has been in business for approximately 40 years, though previously under different names. 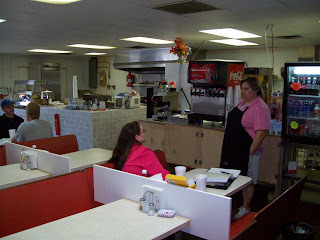 Jamie G. and Erica B. recently took over management of the grill, and it is one of my favorite stops when in the Triad. Echos of the theme song from the old sitcom, Cheers, ring in my head every time I walk through the doors. Seemingly for every person who enters a cheery greeting is shouted out from both the grill and behind the register, along with some inquiry as to "Where were you yesterday?" or "How is that project you are working on at the factory?" Moon's Grill is evidence that there really are still places in America, despite our increasing social polarization and alienation, where "everybody knows your name." The decor of the grill is both happy and homemade, with candles on tables bearing positive-thinking slogans and Biblical art and verses on the walls. In the corner sits an old-fashioned quarter machine, and it is a rarity when someone is not camped out in front of it attempting to get a five- or ten-dollar bill to drop. Moon's is one of those places where it is permissible to stop in and read the paper for a while, and coffee is available, and fresh, all day. "We have a mix of customers here," said Jamie G., one of two owners and regular employees (between Jamie and Erica there is 39 years of restaurant experience!). "Some are so unusual we call them 'Moon's Loons.' We could start our own psychiatrists office here in the back. We have a really interesting - but good-hearted - group." Moon's is placed squarely in the old industrial section of High Point, NC, at 506 Prospect Street. The clientele is largely working class, with occasional large orders flowing in from an entire office or work area. However, there is a sprinkling of retirees who come in for conversation and coffee, firefighters, and even professionals, along with people who wander in from the surrounding neighborhoods. The food itself is both delicious and filling, as one would expect in a grill that serves the industrial worker. One specialty is called the "Moon Burger," a two-patty burger with chili, slaw, and just about any other fixins that you might like. I was once told, "we can even put a hot dog on it for ya." The chili cheese wedges are a great side that can be ordered alongside the main dish. Corn dogs can be had for slightly more than a dollar, and there are five combo meals available (as of this writing) for $3.75, for the value-conscious. However, Moons also branches out beyond the traditional American cuisine menu of the typical diner and adds three salads to the menu (I recommend the Crispy Chicken Salad) as well as homemade cookies and brownies on occasion. 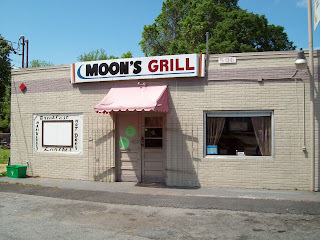 Moon's Grill is at 506 Prospect Street in High Point, North Carolina, 27260. You can contact them by phone (and even phone in an order for pickup) at 336.885.7550. The grill is open Monday through Friday from 5:30 a.m. to 3:30 p.m. The next time you are in the triad, program the address into your Garmin and visit one of the remaining friendly, filling, value-oriented diners that once was typical across the entire country. And tell them that The Carolinian sent you. 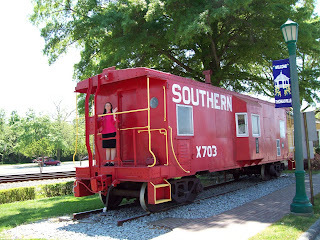 My wife grew up in Thomasville, North Carolina, and we were recently there on a brief sightseeing tour. 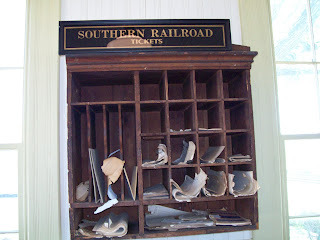 Below are just a couple of sights in the downtown area - I will be posting more on Thomasville a little later. The City of Thomasville calls itself North Carolina's "Seat of Hospitality." Above is the statue of John Warwick Thomas, the founder of Thomasville. 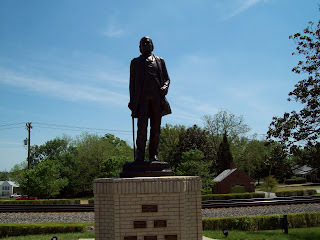 Thomas was a businessman and politician, born June 27, 1800 in Caswell County. He married Mary Lambeth of Davidson County who was from an area known as Cedar Lodge. Thomas was elected as a Whig representative to the North Carolina General Assembly in 1830, representing Davidson County. One of his primary interests was infrastructure and transportation, and he worked hard to bring plank roads and railroads to the area. In 1842, he was first elected to the North Carolina State Senate. In 1856 Thomas introduced a bill in Raleigh for the incorporation of Thomasville, which was ratified on January 8, 1857. Thomas' home was directly across the street from the statue. The place is memorialized with a historical marker. The statue is viewable between Salem Street, Trade Street, and Main Street in Thomasville. At the intersection of Salem Street and Main Street, Thomasville is the home of "The World's Largest Chair," a 30-foot reproduction of a classic Duncan Phyfe design erected as a symbol of Thomasville's heritage as a furniture manufacturer. Thomasville's largest non-governmental business interest has been Thomasville Furniture Industries. Thomasville Furniture has been in business for more than 100 years. Its original name was Thomasville Chair Company. The original chair was actually constructed of wood and leather, in accordance with the specifications for the actual Duncan Phyfe model, in 1922. The original chair was constructed by the Thomasville Furniture company and stood about 13 1/2 feet tall. The original chair was scrapped in 1936 and a new chair, the current chair, was constructed of more durable concrete. The second chair was built through a partnership between the fledgling Thomasville Chamber of Commerce and the Thomasville Chair plant beginning in 1948. The cornerstone was laid for the new chair in 1951 and includes a timebox including, among other things, a Bible, several photos, a city directory, and a letter from then-mayor Harry B. Finch. During a campaign stop in 1960, Senator Lyndon Johnson (campaigning for the vice presidency) once climbed on the chair and delivered a speech to a crowd gathered in the square below (a picture of this event is hung in the visitor's center). The chair has been a gathering point for governors, mayors, beauty queens, and evangelists ever since. Less than a block away from The World's Largest Chair, just along the railroad track, lies North Carolina's oldest remaining railroad depot. Listed in the National Register of Historical Places, the Thomasville Depot was originally built in 1870. The restoration of the depot was completed in 1977, in conjunction with the wave of patriotism and historical interest that accompanied the nation's bicentennial. Today it serves as a visitor's center for the downtown area. 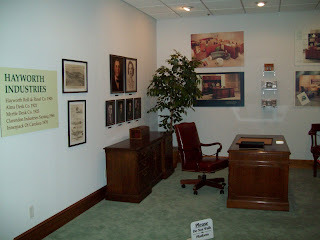 A section of the visitor's center in the depot has been decorated with pieces from Basset Furniture. Accessible from the depot are several walking trails that will guide the visitor through sites such as the downtown's historic churches and its historic commerce. Downtown Thomasville also hosts the headquarters of the Baptist Children's Homes of North Carolina, established in 1885. A museum is on the premises. Winding Creek Golf Course is reputed to be one of the finest public golf courses in the state, and has hosted the Golf Channel's Drive, Chip, and Putt competition. A little further away, but still within the City of Thomasville, is Finch Field, the home of the Thomasville Hi-Toms baseball club. 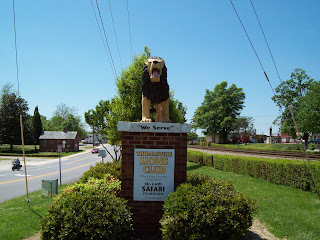 Also downtown is this small monument erected by the Thomasville Lions Club. 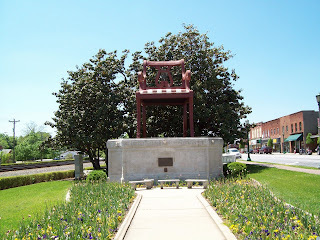 The Chamber of Commerce is almost directly across the street from this monument (which is, itself, alongside The World's Largest Chair), and closeby is also a Rotary monument containing a series of plaques which recommends guiding one's communication by the familiar formula of: "Is it true? Is it kind? Is it necessary?" All of the photos on this page were taken within a one-block radius of The World's Largest Chair, at the intersection of Salem Street and Main Street in Thomasville, North Carolina. If history as a concept involves the teaching of the past in such a way that the past is preserved both in its particulars and in its proportions, then the High Point Museum is an unhistorical venture. "Writing of history, especially that based on the critical examination of sources and the synthesis of chosen particulars from those sources into a narrative that will stand the test of critical methods. Two major tendencies in history writing are evident from the beginnings of the Western tradition: the concept of historiography as the accumulation of records and the concept of history as storytelling, filled with explanations of cause and effect." Noting that proper historiography involves not just storytelling, but storytelling that enlightens one as to certain explanations demonstrating cause and effect, certainly is an argument for proportionality in history. That which is most important (i.e., that which is the most central cause for the observed effects) ought to be belabored, while minor issues are minimized. High Point, North Carolina, is a town that has been almost entirely defined by a few issues: transportation, hosiery, and furniture. Other issues that might be addressed in a proper historical explanation might be the founding of the town, the effect of the Civil War, and the role of tobacco (still grown in much of Davidson and Guilford Counties). Unfortunately, the High Point Museum, rather than illustrating the actual history of the region, chooses to go the politically correct route. More than any other historical topic covered in the Museum is the issue of "Diversity" stated, implied, or illustrated. The High Point Museum is not nearly so much a historical essay as it is a political tract. A left-leaning political tract. Of the 24 discrete exhibits in the main upstairs portion of the museum (the downstairs was closed for renovations and I am excluding the "Commerce Museum," which appears to have been constructed by various large companies in the High Point area), 8 either refer to, illustrate, or imply some minority presence. By contrast, there was one exhibit on the Civil War, one on the Depression, two containing furniture, and one demonstrating certain hosiery tools. One of the initial exhibits actually contains the word "Diversity." Of three exhibits containing fictional mannequins intended to illustrate residents of the High Point area at various times, one was an Indian woman, one was a Quaker woman, and one was a black man. In the attached bookstore, there were dozens of books on African-American history of some sort, dozens of CDs of various black jazz musicians, and a small smattering of material (mostly children's) on indians. By contrast, there was not a single book on High Point history and only two books discussing the importance of tobacco. While I went to the museum expecting to see an extensive exhibit of furniture, textiles, and transportation, instead I was beaten over the head with the blunt end of an uncouth excursion into liberal make-believe. While it is not the purpose of this article to demean any of the legitimate accomplishments of minorities anywhere, the disproportionate focus on the concept of "diversity" (along with poster at the exit for a local "Multicultural Festival") was not only unhistorical, but was dishonest and incomprehensible. I remarked to my wife as we left, "The average person who might visit this museum with a total lack of knowledge about High Point, and who trusted the exhibits to tell them what High Point was about, would leave thinking that the town was some sort of liberal multicultural utopia, but would have no idea that furniture or textiles played a significant role in the town's history." 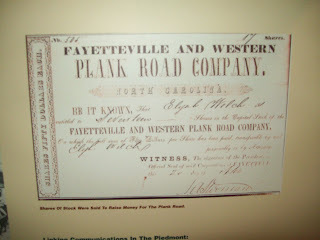 High Point grew up along a plank road constructed by the Fayetteville and Western Plank Road Company (see stock certificate above) between the larger towns of Fayetteville, NC, and Salem (now Winston-Salem), NC. In 1856, the North Carolina Central Rail Road was built joining Goldsboro in the East and Charlotte in the West, and it ran through an intersection with High Point at the plank road. The town received its name by the estimation of certain builders involved in railroad construction that it the area at the intersection of the plank road and railroad was the "high point" (at 940+ feet above sea level) between Greensboro and Lexington. Transportation played an important role in the history of High Point. The town grew rapidly after the railroad's construction and High Point was incorporated in 1859. The area was the home of the High Point Buggy Company and the Thomas Built Car Company, the predecessor of Thomas Built Bus Company (Thomasville is an adjoining small town in nearby Davidson County). But furniture soon came to define the town of High Point. An early furniture maker was Hayworth Industries, later Hayworth Roll and Panel, built a business in lumber and furniture for 98 years, lasting until 2003, when it closed due to its inability to compete with lower-paying foreign competitors. To this day, every six months the High Point Furniture Market is an international event for both wholesale and retail customers interested in the latest furniture concepts. The one area of legitimate history that the High Point Museum does not give short shrift is the influence of Quakers on the area. I have lived and visited all over the southeast, and have never seen a more concentrated presence of Quaker churches in my life. As one resident put it, "The Quakers are growing around here like Johnson grass." 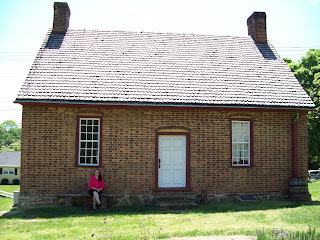 The museum has examples of simple but beautiful Quaker architecture (see above), shows glimpses of Quaker life, and discusses Quaker influence on slavery in the High Point area. One fact that might seem counterintuitive to the average resident of North Carolina is that Quaker influence was responsible for a good deal of fraternization between area residents and carpetbaggers during Reconstruction, based on the Quaker distaste for the institution of slavery. High Point has variously been known as "Little Chicago" (because of a crime wave that concentrated alternately on stealing cars and running moonshine during the roaring 20s and the Depression) and today claims the title of "North Carolina's International City." The museum has decent displays on the Great Depression and excellent information on the founding of the city and the building of both the plank road and railroad. 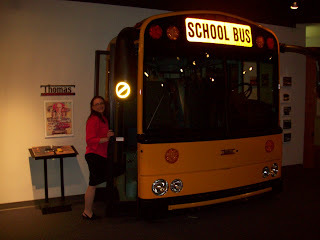 The exhibits in the Commerce Museum are excellent, and completely avoid the political correctness of the main museum. While the city has its points, unfortunately, the High Point Museum is not one of them. 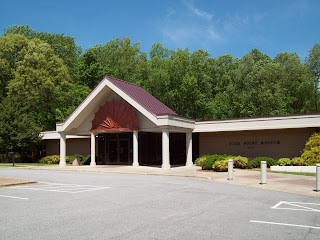 If you are interested in genuine history and have an interest in High Point, I would recommend a visit to the Museum. But you will likely be disappointed, unless you yearn for a "Peoples Democratic Republic of High Point." I grew up at Grainger Stadium. And on Saturday night I returned to see a minor league baseball game with my hometown Kinston Indians. It was the night that they dedicated the press box to Delmont Miller, the Indians' former scoreboard operator and occasional microphone personality, only recently passed at age 42. I have enough experience at Grainger Stadium to remember an owner named Kuhlman, a batboy named Tex, successive generations of Eagles, Bluejays, and now Indians, and I have Tony Fernandez's autograph somewhere. And yes, I knew Delmont Miller. My buddy Robert Dixon introduced me to him when we were all teens. My wife, though, has been to precious few baseball games in her life, and I am not exactly sure that she can distinguish (well) between baseball and golf. I have had to explain such advanced concepts as "bunt" and "double play" to her in the past. Nevertheless, on April 11, 2009, we went out to Grainger Stadium with my now-retired mom and caught the game between the Kinston Indians and the Winston-Salem Dash. Oddly enough, just last year my wife and I had caught one of Winston-Salem's last games as the Warthogs. In my humble opinion, Warthogs was a better mascot name than is Dash. I don't exactly get all of this new age sports team abracadabra, though I have a vague hunch that it is all done in an attempt to "expand the sports market" to women. I have had enough of the abstract team names like Magic, Heat, Fire, and Dash. Whatever happened to Bulldogs? Lions? Warthogs? I presume that it won't be long before some team will rename itself the Rash. If it keeps up, I will someday buy a sports franchise and name it the Rage. But that is another story. So we arrived relatively early and, true to form, having found our seats quickly found the concession stand. Now, I don't want to get into a rant here (partially because there is nothing to rant about - I was actually offered EXTRA jalepenos by one of the young girls working the concessions), but if they are gonna sell all that food, shouldn't some community spirit-mindedness also mandate that they offer not a seventh-inning stretch, but a seventh-inning gym membership? One heaping serving of nachos, one helping of fries, and one "Tribe Dog" (don't fall for it - a "Tribe dog" sounds like it ought to be as big as a hatchet or have a scalp on it or somehow be massively "all the way," but it only has onions and chili on it) furnishing the set-up for a bag of peanuts, and I was jazzed for the game. The thing about minor league ball is that you truly never do know what is going to happen on a given night. When the Red Sox play the Brewers, we pretty well know how things are going to work out 90% of the time. 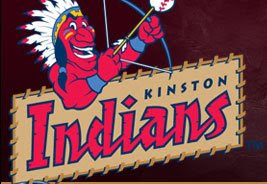 But when the Kinston Indians play the Winston-Salem Rash (Flash? Mash? see the problem with these abstractions...? ), the team that won the game 5-2 only the night before could very well find itself trailing by six runs in the bottom of the eighth inning. I remember Grainger Stadium before they spent $1.2 million on stadium upgrades. I remember when the scoreboard had some guy hanging numbers on it. I remember when behind the foul lines on both sides there was a single set of bleachers, and lots of empty space, so that players used to come out of the dugout and play catch. Now, there is a huge animated scoreboard with flashing lights and coordinated sounds. Now, the area behind the foul lines is filled with bleachers. Delmont and Tex, alas, are gone. Grady Little is gone. Tony Fernandez and Marty Pulley are gone. But I remember seeing Darryl Strawberry play in Grainger Stadium. And perhaps more importantly, I remember sitting there with a dozen dates, numerous family members, and my dear departed granddad. And as I sat there through what seemed would likely be an excruciating game, I shared these memories with my wife. At least she knew who Darryl Strawberry was. Apparently her own granddad had something against drug-addled outfielders. I boasted that I could predict when a foul ball would occur (and I can - a trick I picked up from listening to Harry Carey). Now she owes me some Dipping Dots. And I told her stories about playing catch with my granddad when I became a member of Bethel Academy's baseball team. She smiled, but my mother got a tear in her eye. We talked. We talked about family. We talked about hometown - and hometown legends. We talked about change. And I discovered that Grainger Stadium is a useful metaphor for how much change can take place, and yet everything still remain oddly... stable. And in the bottom of the ninth, Kinston scored five runs and almost pulled it out. Despite the loss, it wasn't a wasted night at all. It's not just that Indians baseball offers a "family friendly" atmosphere (though I have no complaints - even after one of the most lamebrained exercises in umpiring that I have ever personally witnessed, there was no cursing from the stands, though an encouraging round of "You're an idiot!" was enjoyed by all), but we had a great family night out. There is something bout the ebb and flow of minor league baseball - perhaps with an emphasis on the ebb, that lends itself to reflection, bonding, and enough moments of rest to really contemplate what is important. It's an added plus when you can enjoy it all while holding your wife's hand and listening to Ozzy Osbourne's "Crazy Train" several times in a night. The Kinston Eagles/Bluejays/Indians have been on the "cutting edge" (yes, that was an intentional malapropism) of family fun night for 60 years now. I know, because I first came to know Grainger Stadium and the Kinston team about 1978. And for all of the changes, it is an odd comfort to be there and to remember that this is the place where I met Delmont, hung out with Robert, and first saw both Tony Fernandez and Darryl Strawberry. And it was a joy to be able to share that time with my wife and mom. So we lost 10-9. You can't win them all. And there is a dignity in not winning, but scratching back from awful umpiring and stranded baserunners to make a game out of it in the ninth inning, when a quarter of the crowd had already abandoned you in the seventh inning. For 60 years, Kinston baseball has been offering not only family entertainment, but the occasional object lesson in life to those who take the time to indulge and reflect upon the real significance of what is, and isn't, going on around those bases. And for the first time in nearly 20 years, it was good to be home. Have A Better Stay This Vacation! Tractor Supply 10% off orders over $50. Code: TSCAF. Offer valid through 5.30.09. I am a libertarian Christian and an ordained minister who has earned two doctorates. I am a small businessman who has built numerous businesses. I know and love Biblical truth. I am a husband, a dad, a dog owner, and constantly cognizant that I am only a redeemed sinner. I am an evangelist, an apologist, a comedian, and a lecturer on current events. If you would like for me to visit your church, small group, or civic group, please contact me in care of this blog. If there is a place in North or South Carolina that you would like to suggest that The Carolinian visit, including a historical spot, restaurant, business, event, or just about anything else, please drop us an email! Kosher Food at a Great Price! Get the Internet TV widget and many other great free widgets at Widgetbox! Enhance Your Job Skills - At Home! Hardwoods for Home Improvement... at SOFT Prices!